Race and privilege are issues that cry out for new kinds of attention and healing in American society. More specifically, we are being called to surface the dynamics of whiteness especially in contexts where whites have had the most power in America. The church is one of those contexts—particularly churches that have traditionally been seen as the stalwarts of the American religious landscape: mainline Protestant churches. Theologians and Presbyterian ministers Mary McClintock Fulkerson and Marcia Mount Shoop invite us to acknowledge and address the wounds of race and privilege that continue to harm and diminish the life of the church. Using Eucharist as a template for both the church’s blindness and for Christ’s redemptive capacity, this book invites faith communities, especially white-dominant churches, into new ways of re-membering what it means to be the Body of Christ. 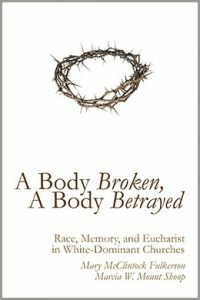 In a still racialized society, can the Body of Christ truly acknowledge and dress the wounds of race and privilege? Re-membering Christ’s broken and betrayed body may be just the healing path we need. MARY McCLINTOCK FULKERSON is Professor of Theology at Duke Divinity School in Durham, North Carolina, and an ordained minister in the Presbyterian Church (U.S.A.). She is the author of Changing the Subject: Women’s Discourses and Feminist Theology (1994) and Places of Redemption: Theology for a Worldly Church (2007).